All images Copyright 2002 S. Guida. All rights reserved worldwide. Pursuing a lifelong interest in astronomy, several years ago I purchased an 8" equatorial-mount reflector telescope, which I enjoy a great deal. Recently I became immersed in digital photography, and a great many of the images on this website are my digital photographs. It was perhaps inevitable that I would get around the combining my two hobbies. I have just begun to take astrophotographs, and I have much to learn, but these first pictures of the Moon really whet my appetite and showed me some of the many things you can do with simple, affordable equipment. I hope you enjoy my first attempt at astrophotography! The moon a little past first quarter phase. 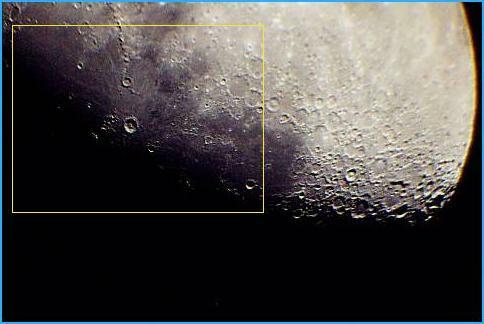 Note how the craters and mountains become visible along the terminator, the dividing line between sunlight and darkness. The area highlighted in yellow is magnified below. 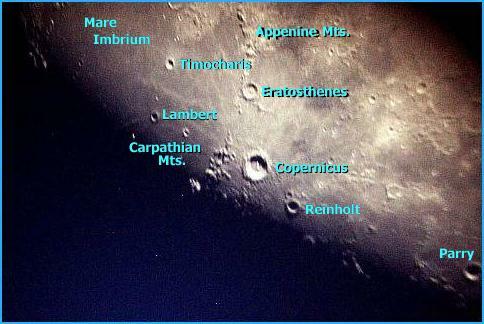 The most prominent feature here is Copernicus crater, just slightly right of center. Copernicus is 58 miles (96 km) wide and 12,336 feet (2.34 miles - 3,780 m) deep! Its central peaks rise up nearly 1200 meters (3,937 feet) from the nearly flat floor. Its steep, terraced walls rise 900 m (almost 3,000 feet) above the surrounding lunar terrain. Mean distance of the center of gravity of the Earth-Moon system from the center of the earth: . . . . . . . 4670 km / 2919 mi (1067 miles beneath the earth's surface at the equator). Mean interval between successive meridian passages of the Moon: . . . . . . . 24 hrs 50.47 minutes (which is why the Moon rises later each night). 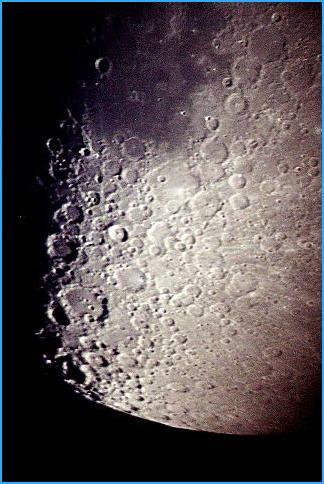 Visible features in this shot of the lunar crater fields in its southern hemisphere are Tycho, the rayed crater, which you can see during a full moon with the naked eye, and Gassendi, a walled plain. With its circular shape and small but prominent craterlet (Gassendi A) on the upper left side, Gassendi takes on the appearance of a diamond ring. Also note the elongated crater Schiller. 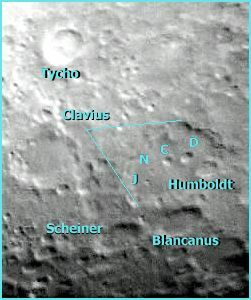 Using high magnification and high-resolution astronomical image processing software, this closeup of the area southeast of Tycho shows the twin craters Scheiner and Blancanus, plus the walled plain Clavius. 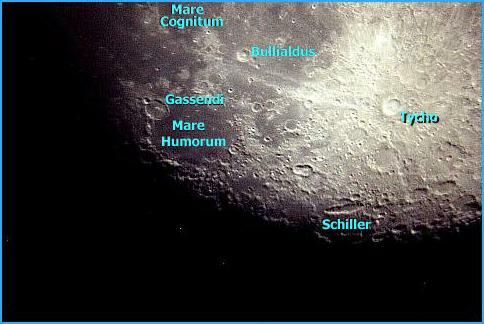 There is an interesting little arc of craterlets in Clavius, starting with Humboldt, then Clavius D, C, N and J. 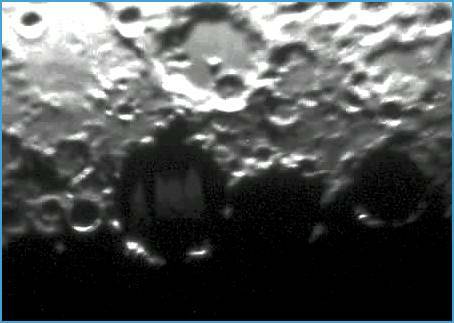 This other high-resolution image shows an interesting display of shadows on the flat floor of the crater Ptolemaeus. This is why observing the Moon is so endlessly fascinating - in every observing session the lighting and shadows are never the same, and you can invariably count on some lunar surface feature taking on a brand new and startling appearance that you have never seen and may very well never see again. The densely packed crater fields near the moon's south pole. 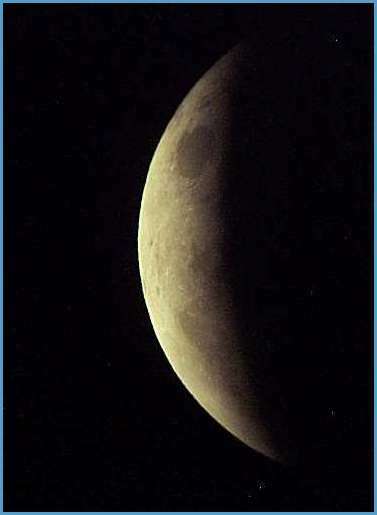 The curved shadow of the earth slides across the face of the full moon in this shot of the May 16, 2003 lunar eclipse.